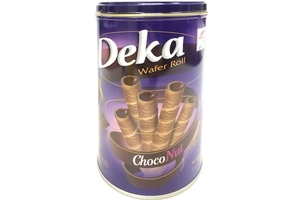 Dua Kelinci Deka Wafer Roll Choco Choco in 12.70oz (360 g) canister. Delicious Wafer roll sticks with chocolate cream. Product of Indonesia. Halal Certified حلال . wheat flour, sugar, palm oil, cocoa powder, peanut pasta, whey powder, emulsifier (soya lecithin(e322), salt, artificial color.